Jan 28 <>, Orchidaceae Will Continue!! Well, Orchidaceae subscribers and Orchid Lovers, Hello and Happy New Year to you all!!! It is just a few weeks into the year 2008 and what a couple of weeks it has been. Bob Roy, the previous holder of this site decided to no longer continue with the orchids-plus-more.com website and the Orchidaceae newsletter. I have been a subscriber to the newsletter for a couple of years and had contacted him several times. So when he decided to step down, I decided to step up! So I have now taken over the orchids-plus-more.com website and the Orchidaceae newsletter. The transition is still a process so please bear with both of us as we iron out the details that are reflected on the website. So, let me introduce myself. My name is Melissa Moravec and I live in the Napa Valley in Northern California about an hour from San Francisco. I have had a deep and abiding interest in plants all of my life. I am a PASSIONATE orchid grower and have been successfully growing and blooming orchids of many kinds for over 26 years. I am currently involved with several orchid societies which continue to add to the experiential knowledge of orchids I have acquired over the years. In addition to orchids, (and other plants as well) I am a winegrower (someone who grows wine grapes and makes wine) living and growing Pinot Noir winegrapes in the Southern end of the Napa Valley in the famous wine growing region, The Carneros. The wine part is a whole other story but if you want to check out what we do or order some wine go to www.casacarneros.com. In addition to orchids and wine, (more of the plant thing) I am a certified flower essence practitioner working with the vibrational energies of flower, gem and environmental essences and their application to the human experience. No, no website for this one but contact me if you are interested. It is a fascinating field. Anyway, on to orchids. This is my first newsletter to this group. I may initially post more frequently than Bob did as I have lots of fun and helpful tips to share about orchids and orchid growing. I am considered a hobbyist orchid grower as I have not grown commercially. I grow almost all my orchids in my home (a few outdoors) and I do not grow orchids in a greenhouse. Largely I grow what are considered "intermediate" orchids. In other words not too hot an environment or not too cool. They are the kind that does the best in my growing situation. Intermediate orchids are what works best in the area that I live. The San Francisco Bay Area and particularly the city of San Francisco is a great environment for orchid lovers. Several really fine commercial growers have their business and greenhouses located around the Bay Area. The temperature is moderate, not too cold and not too hot with a fair bit of humidity from the San Francisco Bay and the Pacific Ocean nearby. Where I live is not quite as ideal for orchids but still, it is an incredible place and perfect for growing many orchids inside. And it is a superb place for growing excellent winegrapes! Particularly Pinot Noir (which I grow) and Chardonnay. This is a great lead in to my next topic that I want all of you to know about, particularly if you live anywhere near San Francisco. The San Francisco Orchid Society hosts the Pacific Orchid Exposition in February of each year. The Pacific Orchid Exposition (POE) is considered one of the 10 best worldwide orchid shows. I have attended this show for many years. Initially I went as an orchid enthusiast, to learn, admire and purchase orchids. They have a benefit night on the Thursday before the main show opens with food and wine, music and incredible orchid displays and vendors. I used to go with friends and make an event of it. We would stay over in a bed and breakfast, dine out in San Francisco and just have fun together and with orchids the show. But the wine they served years ago was definitely not up to my standard. Winemakers can be fussy folk! After taking to the organizers of the event they realized that they could have great wine to go with their otherwise great evening experience, that high quality wineries would be willing to come and pour their wines and show their wares at their Gala Event. That it could be a win/win for all involved. Fast forward to the future (Now) and Voila! The POE now has a select group of 20 high quality wineries that pour their wines at the Benefit Event the Thursday evening before the main part of the orchid show. Great wine, good food and music and the fabulous displays and booths of orchid vendors from around the world. Talk about Heaven! Bringing the Gems of Nature down to Earth. WHEN: Thursday February 28, 2008 6:30p.m. - 10:00 p.m.
Join us for an Evening of Wine and Orchids Wine Tasting, Hors d'oeuvres, Live music (and of course wine by Casa Carneros (Me!) and others). 150,000 Exotic Orchids! Fabulous Plant Displays and Plant Sale. I have permission to give my newsletter subscribers who are lucky enough to be able to attend the Pacific Orchid Exposition coupons for $2.00 off the admission for the February 29, March 1 & 2 dates. (General admission is $14.00) Email me at Melissa@orchids-plus-more.com and I can send you a pdf file of the coupon that you can print and use. Or I can fax you a copy if you email me with a fax number. I encourage you all to go if you can. It is a fabulous show. And if you make it to the benefit night stop by Casa Carneros wine table and introduce yourself and taste some of our wines. Well that is about it for this news letter! I will check in soon with more information about the Pacific Orchid Exposition and of course orchid growing and blooming in general. The "how to" on growing great orchids. Bob Roy's electronic-book, Mastering Orchids for those who want to learn more about orchids and have the best looking orchids around. It a great deal for you as subscribers for just $9.95. 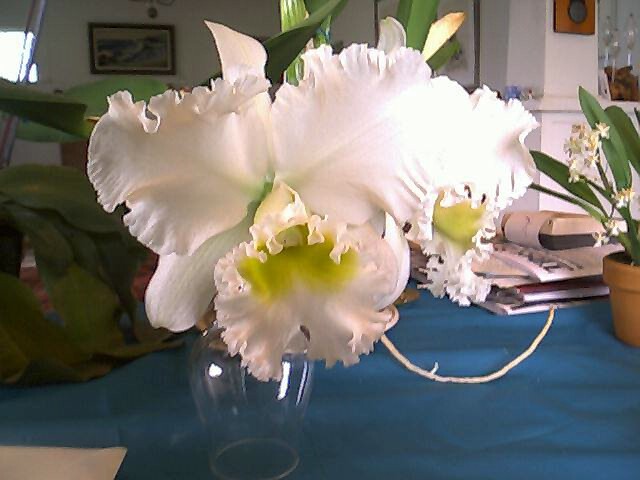 This is a picture of a large fragrant Cattleya that I have rebloomed repeatedly.